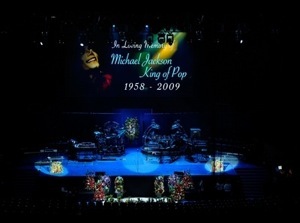 Were you one of the millions worldwide who watched the Michael Jackson Memorial yesterday? The effect that the King of Pop’s death is having on the Internet is unreal — after all, the news first broke online and not on TV. During the Memorial, CNN.com saw 72 million page views, 10.8 million unique visitors and 8.9 million live video streams. As for Facebook, 800,000 out of a million users updated their status from 1 p.m. ET. Internet traffic in general was almost as busy as on June 25, when MJ passed. However, with any world event, the amount of people looking to cash in keeps on increasing. Some affiliate networks have already rolled out programs promoting Jackson memorabilia. Along with affiliates, eBay sellers have been getting banished on a daily basis by trying to pass off fake Jackson merchandise as authentic. Over the weekend when fans were trying to get free tickets to the memorial, several eBay auctions and Craigslist ads came up offering passed for outrageous prices. Fortunately, both websites were very quick to put a stop to that. Getting back to the affiliate issue, how successful are these MJ programs anyway? I haven’t tried them out myself yet, but I’ve been seeing a lot of Facebook ads over the last few days promoting them. From my observation, advertisers can’t use the full name and have been simply using “Michael” or “Jackson” separately. I’ll probably stay away from that niche personally. It just seems a little disrespectful to me to try and make money off of a death. Perhaps my morals are a bit higher than most, but a quick search of some of the top affiliate marketing forums has turned up threads discussing how best to cash in. Being a network owner I see a lot of “trend” email offers come in to capitalize on the traffic (swine flu, MJ, etc). Since I tried getting them – they scrub like 80% of conversions. Simply obnoxious. Not only is it cheesy BUT Google and Yahoo have banned not declined, but BANNED people this week for trying to capitlize on MJ and NOT being valid in their eyes. Alot of traffic is NOT WORTH poor conversions AND loosing your ad stream. IMHO. Yes, I was one of those idiots that tried a trial campaign and got slapped, luckly I charmed them into letting me stay since I DELETED all campaigns and keywords and promised to play by there rules. It’s a difficult matter and I think it deepens how you decide to make money out of it. I’m not to keen about making money with SEM on him, but if you create a big fansite with information about every one of his songs, why not use an affiliate link to his products? As I said, it depends on if you’re only trying to cash in or trying to spread some great information about him meanwhile. On the subject I just noticed the song “Man in the Mirror” just ranked in at place number 3 on UK top 40. A shame people begin listening after he passed away.